The Speyside Scotch Whisky Distillery was built in 1895 and is in the Highland region of Scotland. It produces The Speyside 12 Year Old Single Malt whisky. The distillery is one of the smallest distillery in Scotland and the water source the distillery uses is from the River Tromie and the River Spey. With the distillery being small it does not produce a mass amount of whisky, but this was never the plan for the owner Mr Christie's. There are only 4 members of staff that work at the distillery and are really a small batch production line. 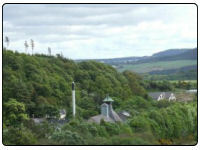 If you would like to see local accommoadtion near this distillery for your whisky trail please visit the page on this site for the Accommodation near The Speyside Scotch Whisky Distillery .